Fela Anikulapo Kuti will be inducted into the Hard Rock Cafe music memorabilia collection on Thursday, May 25. The induction ceremony will coincide with the 20th anniversary of Fela’s death. His children, Yeni, Femi and Seun Kuti will present costumes worn by Fela, including pieces of clothing and shoes to representatives of Hard Rock International in Lagos. The Hard Rock Café induction is being organised by talent agency, Temple Management Company, months after brokering a similar donation by juju maestro King Sunny Ade (KSA). Some of the legends whose souvenirs are on the Hard Rock memorabilia collection include Quincy Jones, James Brown, Jimi Hendrix, Michael Jackson, Prince, and Bob Marley. 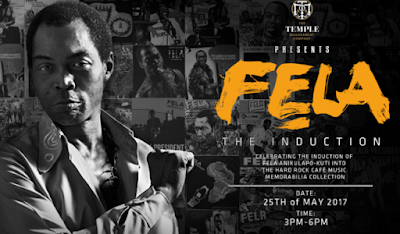 “The Hard Rock Induction is event again reinforces the influence that the great Fela Anikulapo-Kuti still commands twenty years later,” said Mark Redguard, TMC’s head of entertainment. The induction ceremony will also see Femi Kuti perform with his Positive Force band while Seun Kuti will also hit the stage with his Egypt 80 band. One the major highlights of the induction will be the release of a new song dedicated to the late Afrobeat maestro by two-time Grammy award-winning artiste, Lekan Babalola. The song entitled ‘Mr. Lakaye’ (Tribute to Ogun) is produced by Will Angelero and co-produced by Babalola. Lemi Gharioku, who has designed over 26 Fela album covers, will also be present to donate album covers of the late legend.